Hello loves! Today I wanted to share with you my five favorite beauty products that won't break the bank and can be easily found at most drugstores. These products are tried and true and are ones that I continue to reach for every single day. First up is this blush in the shade Rose from Physicians Formula. This blush is my go-to for everyday wear (as you can see I have hit pan on this little guy and am soon in need of a new one haha!) I love how this blush has multiple shades of pink in it so with just one sweep of a brush, your cheeks get a nice healthy glow. 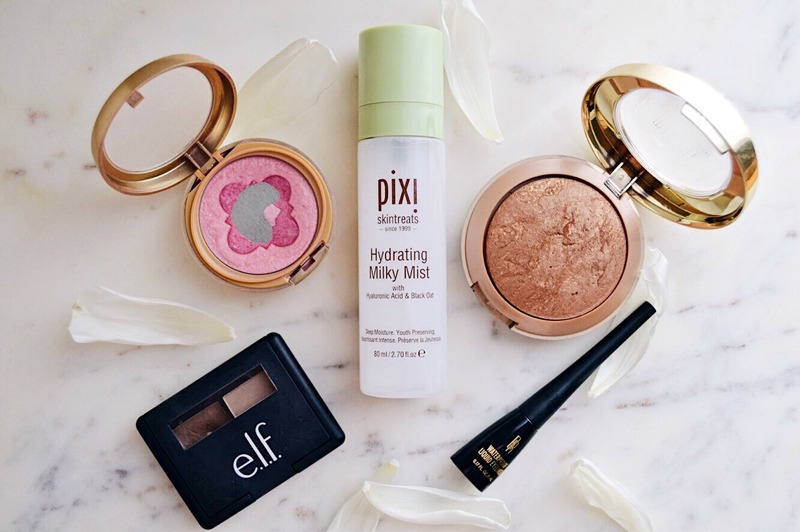 Next is this Hydrating Milky Mist from Pixi. This mist seriously gives me life. I spritz this on my face when my skin feels like it needs a little pick-me-up and I instantly feel refreshed. Side note: this stuff smells incredible. The next item I wanted to share is this baked bronzer in the shade Soleil from Milani. I love how this bronzer has a bit of a shimmer to it so your skin is left with a sun kissed look. I like to use this bronzer and the little brush it comes with to contour my face! This next product is one that is near and dear to my heart and it's this eyebrow kit from ELF in the shade Light. This little guy is the very first product I ever used on my eyebrows (Thank God I found this when I did because my brows were a hot mess!) While I have tried a few other high end brow products, I found that they were too harsh for me so I recently came back to this product and was so happy with the results. This wax and powder combo allows me to create very natural looking brows that stay in place all day long. Bonus: it's only $3!!! This last product is one that I bought on a whim a few months ago because my eyeliner from Sephora was almost out and I actually ended up loving it more than the one I had from Sephora! It is this waterproof, liquid eyeliner from Black Radiance which can be found at Target. I can't say enough about this eyeliner. I love the felt tip which makes creating winged liner a breeze, I love that this is truly a waterproof liner and most of all I love the price. All in all this is a win-win product for me! I hope you all enjoyed this post! Let me know in the comments what are some of your favorite drugstore beauty products! Xo.